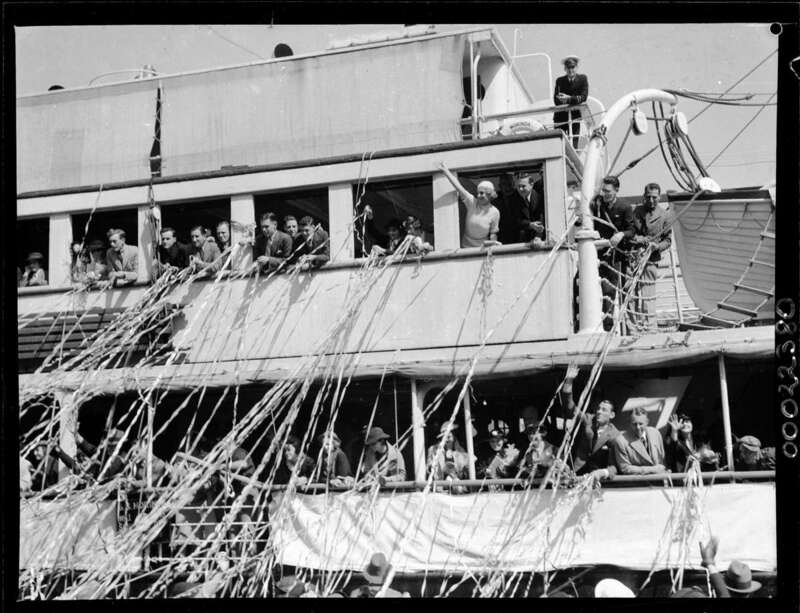 On 5 September 1936, crowds gathered at wharf 10 in Walsh Bay, Sydney to farewell the cast and crew of a new Australian ‘talkie’, Mystery Island. 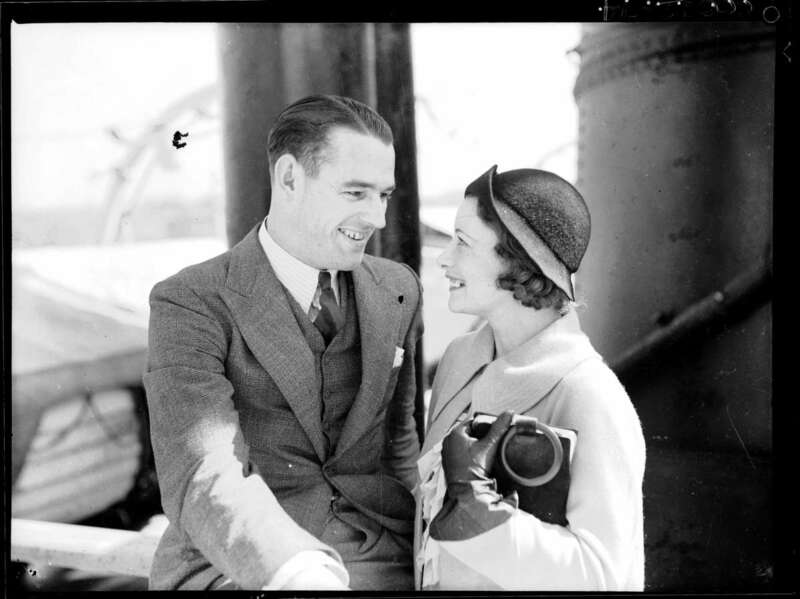 Among those at the wharf about to board SS Morinda was actor Brian Abbot who was photographed, by Samuel J Hood, farewelling his wife Grace Rikard Bell. They appear happily embracing each other, completely unaware that this would be the last time they would see each other. 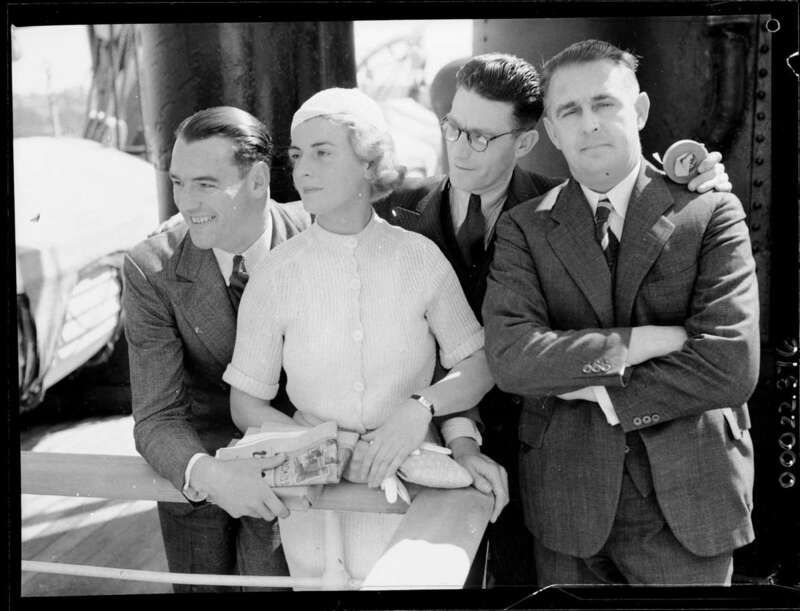 Over a month after this photograph was taken, Brian Abbot and fellow castmate, Desmond Hay, set off on a risky voyage across the ‘stormy Tasman’ from Lord Howe Island to Sydney – the two were never seen again. For months before the Burns Philp liner Morinda departed Sydney, newspapers had reported that the film would be shot in an exotic, uninhabited South Sea location. The cast and crew were to sail to Lord Howe Island to work on the Commonwealth Film Laboratories Company’s first feature-length film with sound. Aside from the location, articles also featured stories on the film’s leading lady, Jean Mort (screen name Jean Laidley), a great granddaughter of Thomas Sutcliffe Mort, the industrialist and founder of Mort’s Dock in Balmain. Laidley was tall and slim with golden hair, had that movie-star look and features in many of the photographs taken on the day. SS Morinda departing wharf 10 Walsh Bay, Sydney. Jean Laidley can be seen waving in the top right window. Hood captured the excitement and glamour of the emerging sound-film industry. Streamers were thrown over the side of Morinda as the passengers waved goodbye, eagerly anticipating the next few weeks on what would have felt like their own mystery island. Trivial reports, trickled back home, of life on the island. In one story, Laidley’s ‘fortitude’ was tested as she picked up a bird which ‘proved so wild that it pecked her arm and hand severely’. According to the magazine, no hint was given as to what those reasons were. Abbot and Desmond Hay (real name Leslie Hay Simpson), set off from Lord Howe Island in the 16-foot motor launch Mystery Star on 6 October 1936. The launch belonged to Abbot and he had reportedly taken it from Sydney to the island with a view to making the return trip in the tiny vessel rather than on board Morinda. One newspaper noted that the launch was ‘unsinkable’; however, these claims were outweighed by most reports which focussed on the risky nature of the adventure and also on the information that the two men were almost completely relying on the engine. After a desperate search aided by the Royal Australian Navy’s HMAS Waterhen, Abbot and Hay were declared lost at sea. 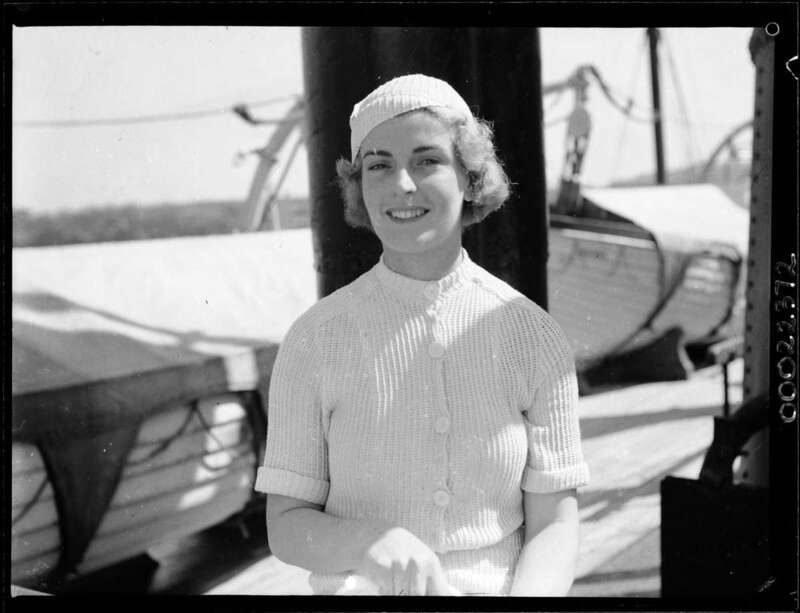 The National Film & Sound Archive have a fascinating array of photographs depicting the crew and cast filming Mystery Island as well as Brian Abbot embarking on his fateful voyage. 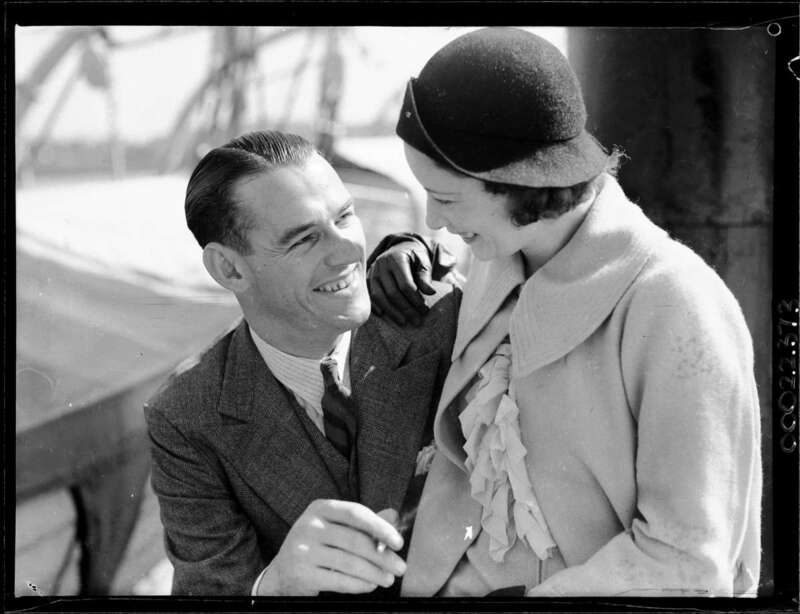 See this blog for more information about Leslie Hay Simpson (Desmond Hay), who also went missing on board Mystery Star. Australian Screen also have two clips of the film Mystery Island which you can view online.